Needy children and families hunger for meat and protein. Our ministry pays local butchers to process donated deer and livestock for food banks and hunger relief programs. Please give today! 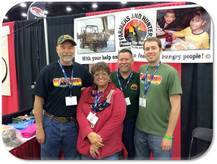 FHFH is the only organization that is recruiting, equipping, and supporting local Coordinators nationwide to enable hunters and landowners to donate deer, elk and livestock to feed the hungry. A gift of any size is significant. Did you know that one average sized deer can provide meat for 200 hungry people? 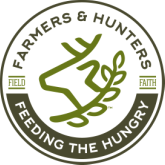 FHFH exists to give hunters the chance to return to their heritage as food providers by transforming deer and other big-game, which are God-given renewable resources, into food for the hungry among us nationwide. FHFH supplies manuals, literature, and other materials to the local Coordinators. FHFH pays the processing fees for having donated deer and other big-game cut, packaged and frozen by licensed, inspected butcher shops. This removes a major obstacle to deer donation. Many people wouldn't donate if they had to give up their deer AND pay to have it processed! FHFH has helps children and families in local areas nationwide by providing protein-rich red meat to the food banks, soup kitchens and shelters that serve the poor. FHFH is able to provide over 1.2 million servings of nutritious red meat to the hungry each year. Over 85% of our expenses go directly to providing program services. Our small staff spends much of its time supporting the volunteer Coordinators who make FHFH happen in their areas. Staff salaries are based on those of similar positions in the local public school system. Our office space is provided by a local business, and most of our advertising is donated by the magazines and television production companies that believe in the organization. Our financial records are reviewed and audited annually by an independent CPA and financial responsibilities within the organization are shared by a variety of unrelated persons.